“Elbrus. Moonlight Night “is a sketch by Arkhip Kuinji on the nature of the Caucasus. A sketch is considered preparatory work before writing a picture. It is made with oil paints on paper. The Russian artist always treated the moonlight with trepidation. At night, the hidden secrets of nature and the essence of things – he believed. The top of the mountain range and the valley of the river at a late hour appear completely different. The light of the stars and the night star is enough to see the rocks and the snow cap of Elbrus. It is the largest volcano in the European part of the continent, which sleeps soundly. The greatness of nature and the fragility of human life – the main theme of the canvas. 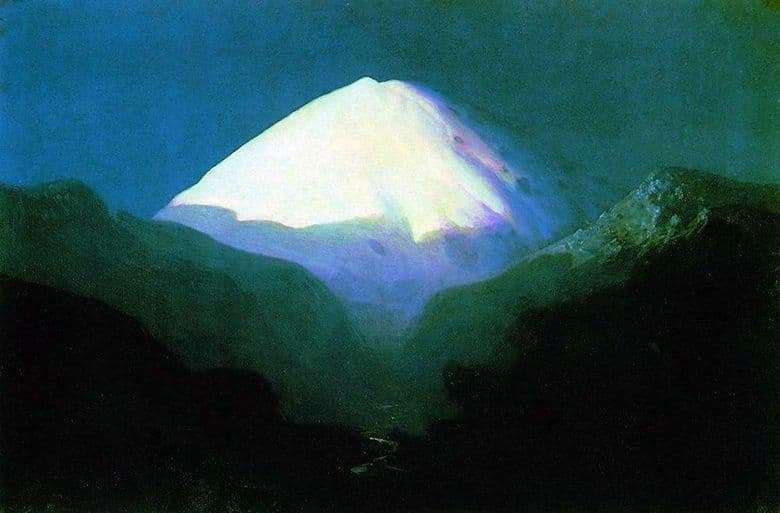 Kuindzhi is a worthy student of Ivan Aivazovsky. The older comrade Arkhip Ivanovich took over the strength, depth and significance of colors. Cold silvery shades are capable of conveying not only the climate and natural phenomena, but also the mystery of the universe. Color solutions create a volumetric space worthy of the greatness of the mountains. On the border of light and shadow, a sharp border is noticeable and the contrast of colors we see. Despite the restrained tones, in detail you can find almost all the palette available to the author. Moonlight is a special matter. Unlike the famous “Night over the Dnieper”, the viewer does not see the moon. There is no light source, but its location in the upper left corner is intuitively felt. Night metamorphosis does not end there. Please note: the river at the bottom of the gorge does not reflect the light of the moon, but of the snowy peak. Being an artistic etude, the canvas perfectly reflects feelings and emotions, which Kuinji wanted to achieve.